OnePlus had announced some time ago that its next product launch would take place in New York on October 30th. However, Apple has just taken that same date to release the new Macs and iPad Pro. The Chinese company has responded by moving its own event up by one day. 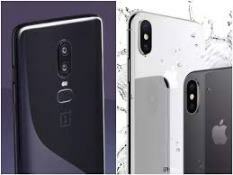 OnePlus had stated that its next device would definitely be the 6T, and that this phone would be released in an event on October 30. Oddly enough, Apple has recently disclosed its decision to hold their own next product launch on the same date. The OnePlus event is to take place in a New York setting; coincidentally, the Apple event will be in Brooklyn. OnePlus has reacted to Apple's move by re-scheduling its own plans for a different day. The 6T will now be unveiled at the same location on October 29. The company's CEO, Pete Lau, took to the oneplus.com forum to inform fans and event-goers of this change. Lau stated that he and his team came to this decision after lengthy discussions with their press contacts and other interested bodies. He also claimed that ticket-holders who could now not attend will have a chance to apply to OnePlus for a refund. Those who hold tickets and still want to attend will have the relevant costs covered, according to Lau's post. It will be interesting to see how these gestures on OnePlus' part play out, and which launch strategy will work out for which company.